Posted rate includes all massage and specialty massage; Deep Tissue, Swedish, Reflexology, Thai, Injury, Trigger Point and Seated. Optional 60/1hr, 90/1.5hr, 120/2hr, 180/3hr or 240/4hr available. 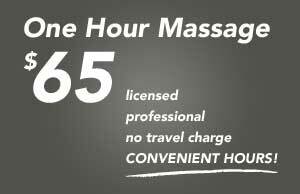 Due to travel cost price is different if bundled with a massage. I offer only the best therapies of seated massage to your office and thai or table massage therapy to your home or hotel room. My massages help from stress relief to injuries of many kinds including auto accidents. All you need do is relax. I bring all of the equipment necessary for the styles of massage I offer such as the massage chair, thai mat or table. Along with all the linens, towels, massage lotions and music if needed. If you have never experienced chair, thai or table massage, read my FAQ (frequently asked questions) page for a description of some expectations you may experience. I am currently serving the greater Denver metro and front range areas. This includes Fort Lupton, Greeley, Mead, Berthoud, Frederick, Firestone, Erie, Brighton, Longmont, Boulder, Parker, Highlands Ranch, Castle Rock, Westminster, Thornton and more! Don’t hesitate to call and check if I serve your area too! *pricing discounts are based only on same appointment. Monday-Friday 9am to 8pm and all appointments are first come first serve.